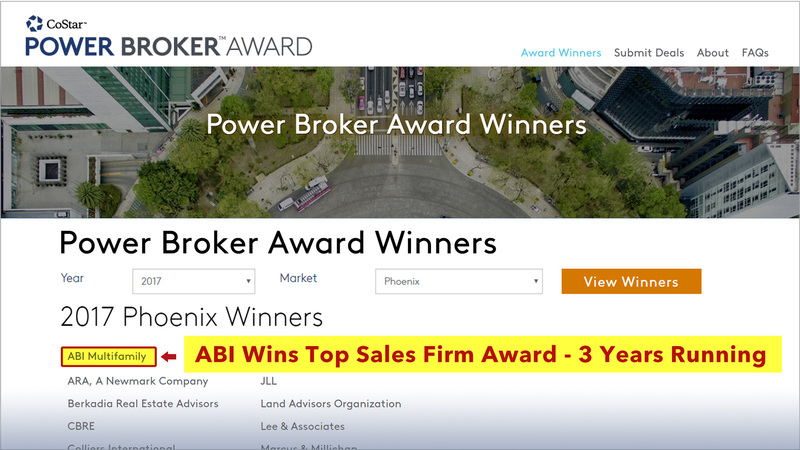 Phoenix, AZ, April 9, 2017 – ABI Multifamily, the Western US's leading multifamily brokerage and advisory services firm, is proud to be named a CoStar Power Broker: Top Sales Firm - 2017 Phoenix MSA. The ABI Team strives to provide the very best in brokerage and advisory services, as well as market research, news, media, and analysis, and we're happy to report our clients and peers in the CRE industry have taken notice for the third year in a row. As a brokerage and advisory firm that focuses exclusively on apartment investment, our understanding and depth of knowledge with multifamily transactions is unmatched in the Phoenix, Sacramento, San Diego and Tucson markets. Our regional ABI teams are composed entirely of seasoned advisors with proven track records within their respective submarkets. We understand local fundamentals and key players, giving clients unparalleled access to market knowledge and manpower.